A reporter from a Houston TV station was filming his stand-up at Super Bowl media day. “Talk about a media frenzy!” the reporter said into the camera. “I can barely even move around this place!” To demonstrate that, he made a faux-dramatic lurch toward his camera, as if a New York subway car had hocked him up and spit him onto a platform. Cut. The reporter and cameraman spoke — they decided they should do another take. “Talk about a media frenzy!” the reporter said in the same frenzied register. “I can barely even move around this place!” He made another lurch toward the camera. I happened to be standing nearby. I looked at the space around the reporter. There was several feet of open space surrounding him. The spacing equivalent would have been a New York subway car at 10 a.m. on a Saturday, somewhere near the end of the line. The reporter was making a bid to be the heir to the Today show’s heroic canoeing correspondent, who braved six inches of roaring waters in the name of journalism. Talk about a media frenzy! Talk about a meta exercise! It was Super Bowl media day! Media day poses a quandary to non-idiots: What are we supposed to do, anyway? The gags have been done. The world-weariness has been affected. We’re trapped in a kind of leaguewide Reddit AMA, with enough “funny” questions to pulverize even the linebackers. What one does — or so I told myself — is try to find something that seems real. The first thing I learned: You don’t need to be media to attend Super Bowl media day. The NFL sold tickets to the public this year for $28.50 apiece. When I got to the US Airways Center (home of the Phoenix Suns), the paying non-media were walking through the front doors while we non-paying media were told to use the back. There is a lesson there somewhere. What does a ticket buy you? According to the NFL, fans would “sit in the stands in the arena and watch thousands of media from around the world interview members of the participating Super Bowl teams on the floor.” As it turned out, the league put video feeds of the interviews on the big screen. Fans used radio headsets to listen to Earl Thomas on Channel 1, Russell Wilson on Channel 2. It was like the setup at 24 Hour Fitness before they put individual TVs on every treadmill. “Fans also will have access to concession and merchandise stands throughout the day,” the NFL added. Before the Seahawks players entered the arena, NFL Network “personalities” like Michael Irvin and Terrell Davis patrolled the floor like pit bosses. (This season, Irvin started giving motivational speeches in Week 1, and continued through the Pro Bowl, and was probably motivating someone to do god knows what on Tuesday.) The players came in through a WWE-style entrance to arena rock, proving that in 2015 no player can change rooms unless the act is set to music. Indeed, the rest of the Seahawks were shoved out on a kind of media day vision quest, wherein they wandered the arena floor hoping to bump into a reporter. Why, yes, the look on their faces said when they saw you, I’d be happy to expound on your thesis. “Somebody asked me why McDonald’s doesn’t sell hot dogs,” a back-up guard named Alvin Bailey said. OK, maybe not that thesis. But for all the sorting into haves and have-nots, media day also has a democratizing effect. Players whom the press studiously ignores during the season find themselves besieged by Danish TV reporters and local news guys who just need “sound” from someone in a uniform. How many interviews do you do on average each week of the regular season? I asked Tarvaris Jackson, the Seahawks back-up quarterback. And how many have you done in the last 15 minutes? As to the media: They are what they thought we were. Lurch Man was matched and then some by Barrel Boy — yes, a shirtless man wearing a barrel — from local radio station KNIX. I could imagine Barrel Boy on the air the next day, talking about his “embarrassing” time at media day, while a fart noise played in the background. There was the Finger Puppet Gal. Tarvaris Jackson was asked to repeat a quote from The Hunger Games. (He has not seen The Hunger Games.) An Australian reporter asked a player, “Are you famous? Can you explain to me what the hell Deflategate is?” Another reporter told a player, “Check this out, I’ve got a little test for you … ” (The player’s eyes grew wide.) David Feherty from the Golf Channel was there, searching, he said, for something other than the “white stiffs” he sees on the course. I waited while Marcus Burley, a defensive back who has yet to make a tackle in the postseason, finished up with a reporter. I felt a tap on my shoulder. “You waiting for him?” a TV reporter asked. Yeah, I said, but I’ll be quick. A few blocks over, the league had erected an exhibit called the NFL Experience. (Paid name: The NFL Experience Engineered by GMC.) It raised a question: Where would you have to go on this earth not to experience the NFL? What federally administered tribal area? I came upon the building after dark. It was bathed in a purple, supernal light. Rousing music played — it was like getting in line at Space Mountain and hearing the same score for an hour. Apparently, this had actually been a problem earlier at the NFL Experience, when crowds clogged the building. “It’s the NFL long-line experience,” one mom told the Arizona Republic. Before we die, there will be an NFL theme park. In fact, an executive for the Pro Football Hall of Fame recently proposed a version for Canton, Ohio, in which actual elderly NFL retirees would live in a nearby “village.” “We’ve been using an analogy,” he said, “the Disney World of football.” It at least makes you long for a bloody Westworld fantasia in which Carl Eller and Raymond Berry would rise up and kill the tourists. Until then, we’ve got the NFL Experience. Here, TV images of NFL Network personalities — some of the same ones who’d been on the arena floor at media day — explain the rules of the attractions to you as C-3PO does at Star Tours. Go to a big sporting event and you inevitably wind up at a trade show. 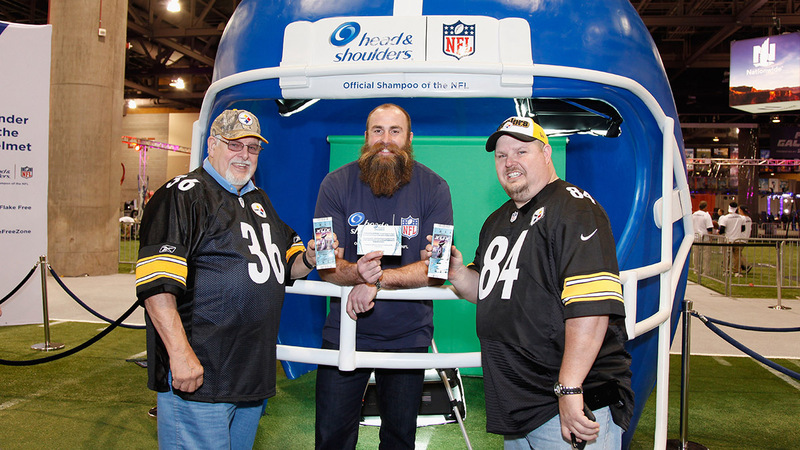 The non-contact parts of the NFL Experience showed off the league’s wares. There were Super Bowl rings under jeweler’s glass; a bored-looking Knile Davis waiting to sign autographs; a newly relevant football-manufacturing clinic from Wilson; and an exhibit called Football Operations, which explored in narcotizing detail topics like NFL field certification. All that was missing was an animatronic Ernie Accorsi offering you a no-cut contract. On a raised platform, the NFL had created exhibits honoring each league commissioner’s tenure. I gravitated to “Roger Goodell: 2006 – Present.” There were tchotchkes: a Peyton Manning jersey and a box of Jerome Bettis World Championship Crunch. But most interesting was the text describing Goodell’s reign: “In recent years the NFL has addressed a wide range of issues, including player health and safety, the medical needs of retired players, personal conduct, revenue sharing, stadium construction, media innovation, and international development.” It’s the language of a presidential library, and I’d give a month’s salary to see the track-changes version of that sentence. Just as athletes now must enter a room to music, every event even tangentially related to sports must feature at least two people trying to “pump up” the crowd. The NFL Experience was no different. Whuh? I didn’t have time to ask, because after he reacted, Sanders quickly darted away. I had to get away from anything meta, anything buckled to a corporate sponsor. A shooting competition featuring Old West firearms seemed promising. I drove north to the town of Carefree. Greater Phoenix is a metropolis of smiles and happy sighs: Carefree, Surprise, and (the best yet) El Mirage. I found the shooting range but no cowboys. “I think you got misinformed,” a 60-year-old man said. The man was holding his dentures in the palm of his hand. He placed them in his mouth, and, with that action complete, offered himself to me as a substitute. He was a cowboy, unbranded. Gary Stevens is a modern cowboy. He travels in a 34-foot trailer with a DirecTV dish. He buys Cheez-Its in bulk at Costco. But Stevens maintains a sartorial commitment to the Old West. When I met him, he was wearing a black bowler hat with a band made by a “full-blooded” Navajo, alligator-skin suspenders with sterling silver clips, and a holster. 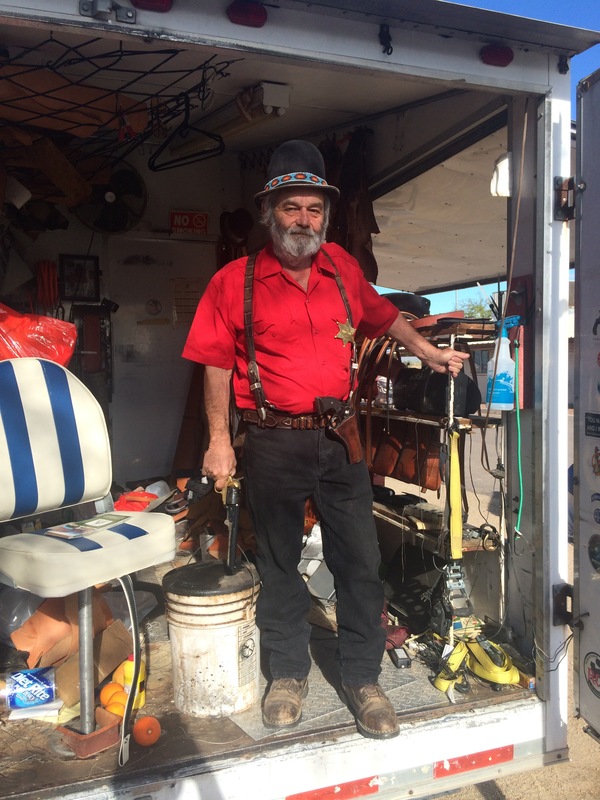 He opened a compartment on the side of his trailer and produced his cowboy gun. He’d stored it there the night before. What’s your drink of choice? I asked. But then, I reminded him, you have to taste the Diet Rite. “That’s 45-caliber Ruger Vaquero,” Stevens said, putting the gun in my hand. “It’s named after the Mexican cowboy. It’s pretty good.” The pistol was heavy, even after Stevens had emptied of it of six live bullets. Are you accurate with this thing? I asked. Stevens summers in Panguitch, Utah, a cheap-motel stop on the way to Bryce Canyon. He makes very fine shotgun-shell pouches out of materials like stingray, elephant, and alligator. He was the owner of a beloved dog named Rat Dog (1992-2010) and he can produce, almost unbelievably, a picture of Rat Dog being held by country singer Barbara Mandrell. His trailer has bumper stickers that read “Obamacare: Bend Over & Cough” and “I Carry A Gun, A Cop Is Too Heavy.” He crunched a few Cheez-Its in his hand and threw them to some nearby sparrows. Our conversation was punctuated by the pop-pop of men shooting trap at the gun range nearby. They were the sort of elderly men who wait in the parking lot of a muni golf course 30 minutes before the earliest tee time. Stevens and I walked over to the range and looked at the obliterated Day-Glo orange clay targets they’d left behind. It was like a thousand highway traffic cones had self-combusted. Twenty-foot-high saguaro cacti loomed over our heads; we could see the Bradshaw Mountains on the horizon. Are you going to watch the Super Bowl? I asked the cowboy.